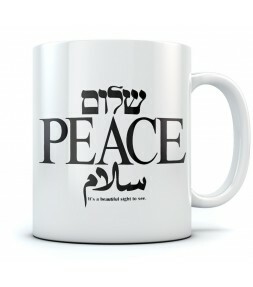 This coffee mug with inscriptions for peace in English , Arabic and Hebrew is the perfect way to express your positive hope for the future and to always remember the dream of peace in Israel! Make sure to notice the inspirational message on the bottom - "It's a beautiful sight to see". 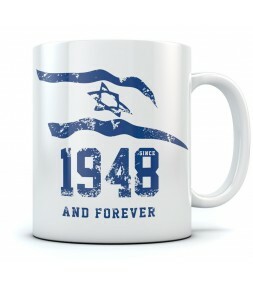 With a proud Israel flag flying boldly in the background, this 1948 and Forever Israel coffee mug is an excellent way to start your morning and perfect for expressing your support of Israel EVERY DAY! 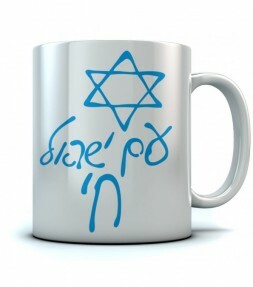 This inspiring Star of David coffee mug with Israel inscriptions in both English and Hebrew is a great way to start your morning and express your support for Israel at the start of every day! 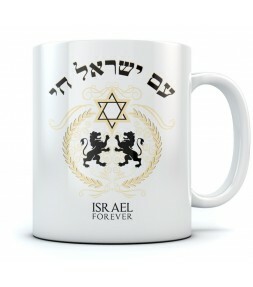 Keep Israel in your heart always with this classic Israel Forever coffee mug - complete with the Hebrew expression "Am Israel Chai" and featuring the insignia of the Lion of Judah. 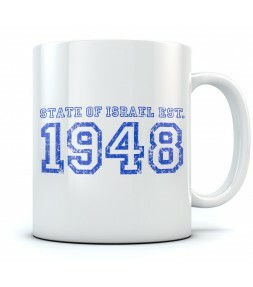 Featuring the year 1948 - the year the Jewish state was founded - and the "State of Israel est." 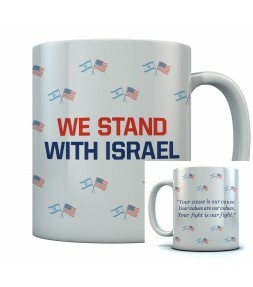 inscription, this classic coffee mug is a great way for you to support Israel on any day and EVERY DAY! 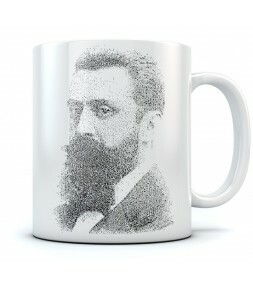 Show your respect for one of the founders of Zionism and a visionary for the State of Israel as you drink your morning coffee. 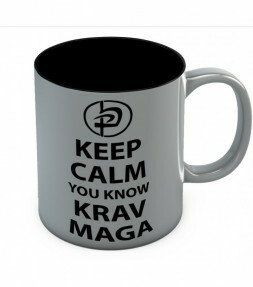 Talk about a motivational moment to start each new day! Wow - now THAT could actually be pretty inspiring!! 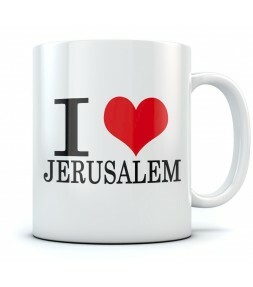 Featuring a big red heart that shows what you really care about, this I love Jerusalem coffee mug is a cheerful way to enhance your coffee in the morning as you fondly remember Jerusalem and the Holy Land of Israel. 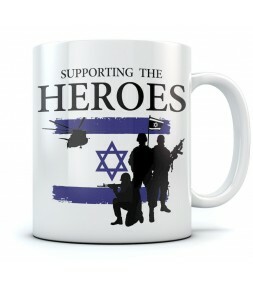 Show your support for the real heroes of Israel - the Israel Defense Forces - and give them your full respect every morning as you drink your coffee in order to start your day with an inspirational message of respect for Israel's heroes. 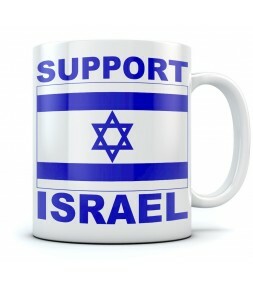 This eye-catching Israeli coffee mug with a proud Israel flag has a great message to start your day, every day. 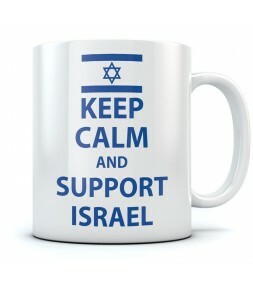 "Keep Calm and Support Israel" - definitely some of the best advice we have run across, in a long time. 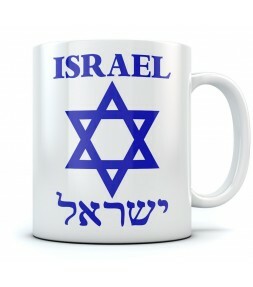 SHALOM - and Good Morning from Israel! 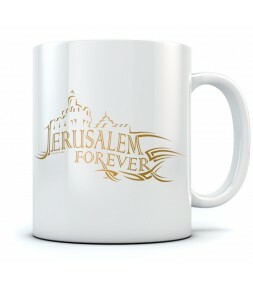 Featuring the memorable skyline of the Old City of Jerusalem and a lovely golden inscription, this Jerusalem Forever coffee mug is the perfect way to remind you of Jerusalem and the Holy Land every time you start your day! 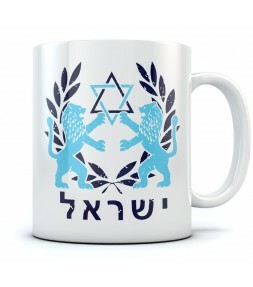 This lovely coffee mug has a lovely Lion of Judah insignia and features a Star of David with a Hebrew inscription that says Israel - just to make your morning coffee even more meaningful AND more memorable than usual! 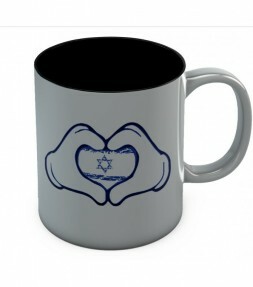 The big blue striped Israel flag with its prominent Star of David symbol and the large inscription "SUPPORT ISRAEL" makes this coffee mug the perfect way to start your day every morning - and one that is definitely is a proud statement in support of Israel and designed to be held in your hands daily. 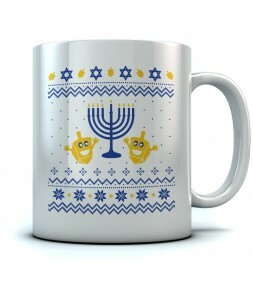 This kippah-clad smiley face with 2 payout sticking out to the sides and an extra wide grin is an excellent way to get your positive attitude ready for the new day ahead! 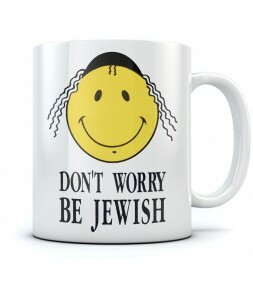 "Don't Worry Be Jewish"! 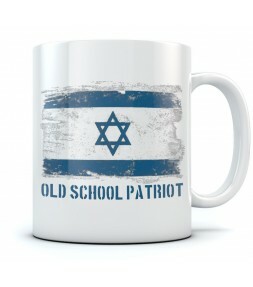 With an artistic depiction of a bold Israeli flag and the proud inscription Old School Patriot, this coffee mug will express your support of Israel every time you drink your morning coffee - as well as any time you use it! 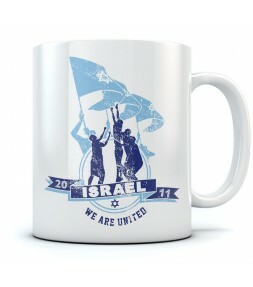 This inspirational design of children playing underneath the Israel flags flying proudly in the background is a great way to show your support for Israel and to remember the long journey of the people of Israel and its supporters - and one that has definitely built the State of Israel into something to truly be proud of today! 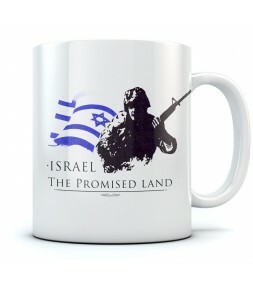 With a moving image of an Israel flag flying behind an IDF soldier, the powerful inscription "The Promised Land" on this coffee mug will be a reminder to you daily as you show your love for Israel and the Holy Land and give your respect to the IDF soldiers that protect the promised land from its enemies. 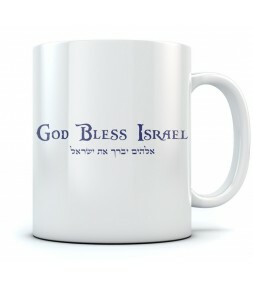 With an inspirational prayer inscription "God Bless Israel" written in both English and Hebrew text, the lovely motivational message on this Israel coffee mug is an excellent way to reflect on Israel and keep the powerful blessing close to your heart always! This funny Israel coffee mug uses a little extra "chutzpah" to boldly express to the world that you want a kiss, JUST BECAUSE you are Jewish. Actually, we can't think of a better reason! Show your pride for the elite IDF counter-terrorism commando unit Duvdevan with a Hebrew coffee mug that will keep Israel's best close to you always. Breaking with traditional U.S. policy, Trump officially recognizes Jerusalem as Israel's capital. 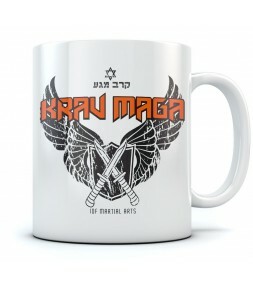 Show your support and favor for this decision with our awesome design, sporting the US & Israeli Flag , and the bond Israel has with it's American Ally. This popular "Tzahal" IDF mug has the Israel Defense Forces symbol displayed proudly in both English and in Hebrew inscriptions! The cool illustration of evolution that is shown on this Krav Maga Mug makes a graphic metaphorical impact regarding the incredible progress of self defense over the ages. "Keep calm cuz the Mossad is here" is a classic Mossad Mug will remind you and your friends that the Mossad is always there, somewhere to protect you. 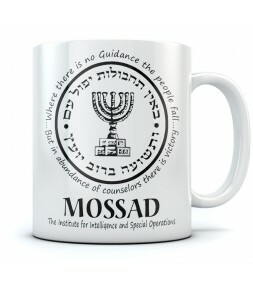 The Israeli Mossad is legendary worldwide as a secretive and deadly organization. 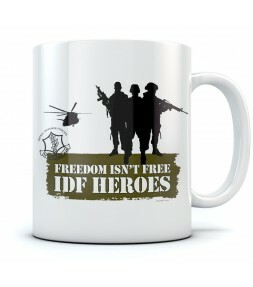 operating everywhere and nowhere as Israel's longest arm in the fight against it's enemies. 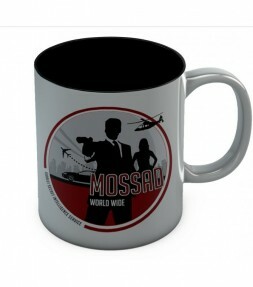 among the known actions of the stealthy agency are hunting down Nazi war criminals and locating and eliminating terrorists that pose a threat to all the free world. 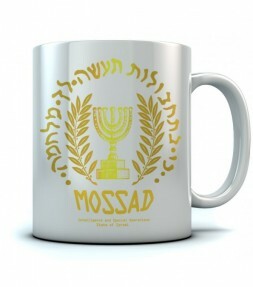 This Golden Mossad emblem mug is a limited edition design. 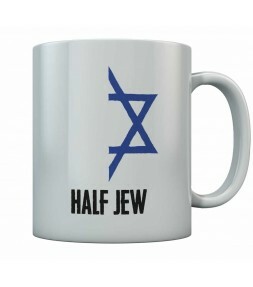 A Funny mug with the words "half Jew." Religion helps define who you are. 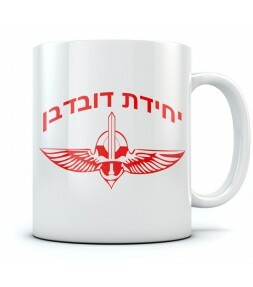 Show pride in your faith with this unique, Mug design!